Luxury, Boutique, Beachfront Eco-hotel, Perfect for Couples. 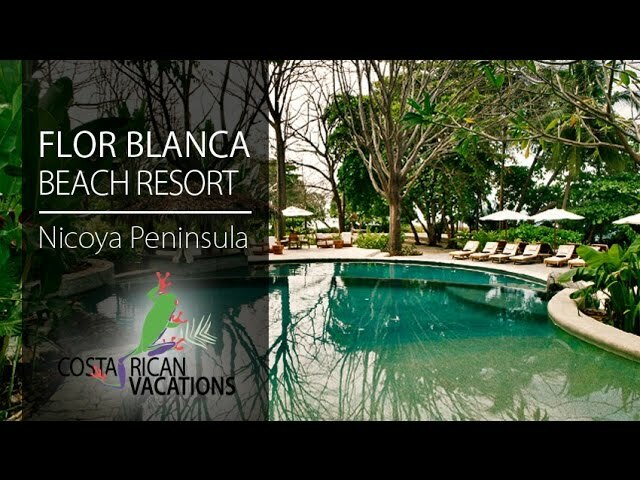 Nestled in the the remote jungle of Santa Teresa—and just steps away from the beach—Florblanca Beach Resort is a luxury, boutique eco-hotel. Florblanca is a great option for couples, families with older children, retreat groups, and anyone searching for a tranquil escape from the everyday hustle. The oceanfront property is comprised of 11 villas on seven acres of beachfront jungle. Each unit offers an open-air living area with hammock for two hanging along the grand opening to the surrounding rainforest. The hotel’s commitment to nature and the local community shows in the attention paid to the flora and fauna in the area and the ongoing sustainability projects at both the property and nearby town. All units are equipped with A/C in the bedrooms, safe deposit box, hair dryer, minibar, and coffeemaker, small seating area, and indoor/outdoor bathroom with garden shower. In order to help clients disconnect, this property doesn’t have TV sets in the rooms, but there is a TV area near the restaurant guests may use. Complimentary WiFi is offered throughout the entire hotel. Their fabulous indoor/outdoor restaurant Nectar offers seasonal menus using organic local produce with Latin and Asian influences and innovative dinner menu that changes nightly. They will accommodate special diets with advanced notice. Other on-site amenities include a fabulous spa, a Jacuzzi, an ocean-view yoga pavilion, a gift shop, and fitness center. Breakfast is not included at Florblanca, but can be added for $25/person. Villas feature art made by locals who craft pieces out of Costa Rican materials, giving the hotel a more authentic feel. The hotel’s surroundings make it ideal to practice yoga. Spa Bambu offers countless beauty treatments and massages. Activities around the area include: surfing, hiking, kayaking, fishing, snorkeling, horseback riding, and more. Opportunity to truly disconnect without televisions in rooms. Level 4 CST (Certificate of Sustainable Tourism).